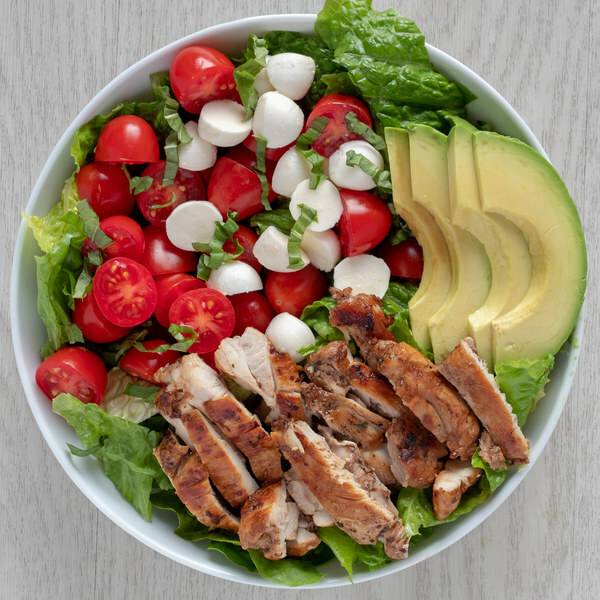 ← Balsamic Grilled Chicken with Fresh Mozzarella & Avocado Salad Bowl. Peel and mince garlic; transfer to a small bowl. To finish the marinade, add balsamic vinegar, olive oil, maple syrup, dried basil, and salt to the bowl with the garlic; whisk to combine. Transfer chicken to a shallow bowl. Pour half of the marinade over the chicken and stir until well coated. Set the remaining untouched marinade aside to use as salad dressing. Once the skillet is hot, add oil and swirl to coat the bottom. Add chicken and cook until cooked through, 4-5 minutes per side. Transfer to a plate and set aside to cool. Chop romaine crosswise into strips and divide between bowls. Halve grape tomatoes and add to the bowls with the romaine. Cut the fresh mozzarella into bite-sized pieces and add to the bowls. Halve and pit the avocado. Slice thinly while still in skin, then scoop out and add to the bowls. Slice chicken into strips and add to the bowls. Pick leaves off the basil stems, roll up crosswise and thinly slice into ribbons and sprinkle over top of the salad. Drizzle with remaining dressing and enjoy!